You can find tributes to Chicago printed on just about anything, creative types have put a Windy City stamp on anything from t-shirts to belt buckles to wind chimes. This isn’t unique to Chicago, most cities have monetized their brand, and in fact the little stores that sell Chicago merchandise are a pillar of the small business community. Keeping a city trendy is a key responsibility of these little stores, and typically larger brands don’t attempt to directly compete in that space. 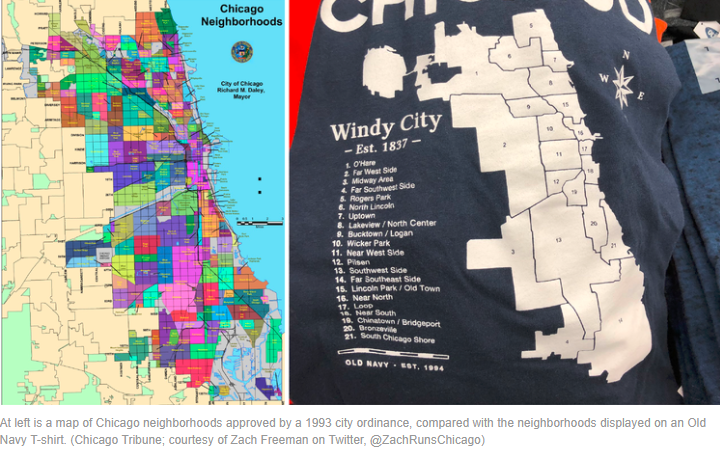 Old Navy recently took a shot at appealing to the homegrown passion of Chicagoans and released a sweatshirt meant to display the map of the neighborhoods that create the borders of the city. The release of this sweatshirt did not go well. The first tweet about the shirt went viral locally and the debate grew around legitimacy of the lines. After Old Navy became aware of the issues with the shirt, which has been available for three years, the retailer through a spokeswoman pledged to have one with “a new design in the near future.” according to an article from the Chicago Tribune about the incident. Old Navy has “long offered T-shirts in Chicago with designs that celebrate this amazing city and its many unique neighborhoods,” spokeswoman Liz Nunan said in an email. Whether or not Old Navy is able to salvage this situation remains to be seen, but my guess is they may avoid maps for the foreseeable future. San Francisco is extremely expensive, beautiful but just insanely expensive. So it’s not a huge surprise that tech giants are starting to either relocate to other cities or send portions of their workforce to other cities. 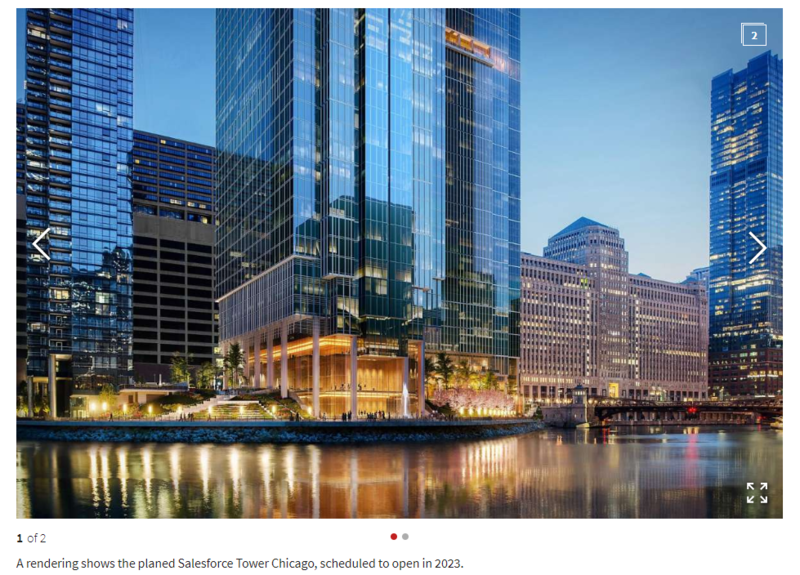 Chicago is set to benefit from such an arrangement, with the announcement recently that Salesforce will pay $475 million over 17 years for a 500,000 square-foot-lease at Wolf Point downtown. It will relocate 1,400 existing employees from California to Illinois, then hire an additional 1000 employees in the downtown office. All of this according to an article from the San Francisco Chronicle. Christmas brings out the best of our city. Decorations and lights make Chicago shine against the dreary weather backdrop that sometimes (always) invades us around December. The center of the Christmas action is the Christkindlmarket Chicago. 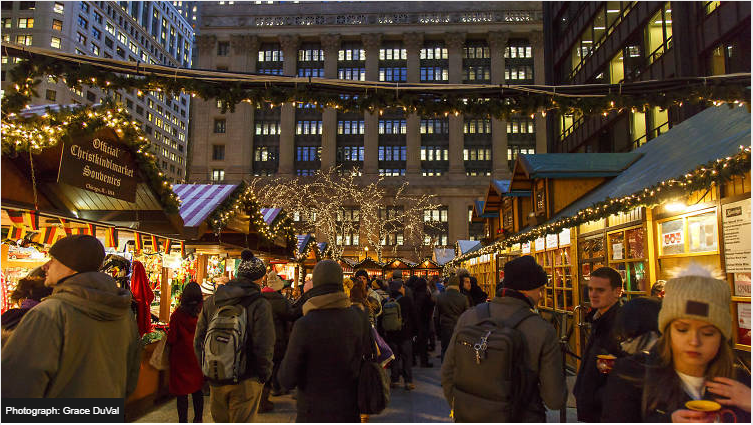 The annual holiday market, based off of similar festivals in Germany, turns Daley Plaza into a small city of holiday cheer. Food, handmade gifts, clothing, ornaments and of course hot wine served in a souvenir mug are just a few of the attractions to enjoy in the market. Knockwurst and Sweet potato pancakes (this guy’s personal favorite) are on hand as well, so your family can eat, drink, and shop your way through an evening like a true American. 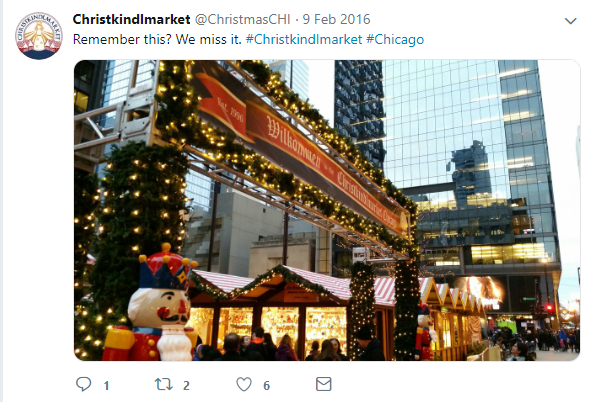 Christkindlmarket runs from November 16 to December 24, 2018. The market is open Sunday through Thursday 11am–8pm, Friday and Saturday 11am–9pm. If you don’t feel like braving the cold, just search for #christkindlmarket on Twitter & Instagram to enjoy the views from the comfort of home. Illinois turns 200 years old this month, and of course Chicago plays a notable role in the rich history of the State of Lincoln. 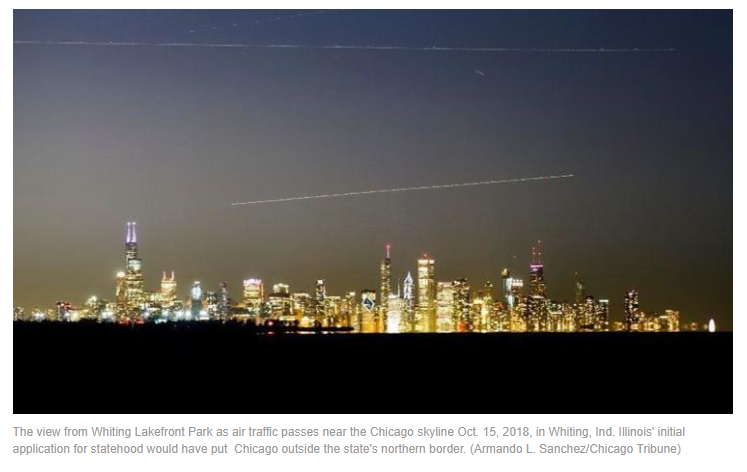 In an article from the Chicago Tribune detailing the city’s contributions over the years, I learned that Chicago was very nearly part of Wisconsin instead of Illinois. The initial application for statehood held the northern border of Illinois approximately 50 miles south of where it currently lies, which would have made Chicago and the Lake Michigan coastline across the border. Thankfully Nathaniel Pope, the Illinois Congressman at the time saw the opportunity that presented itself in Chicago’s waterway access and natural resources and redrew the lines. Other contributions of note from Chicago include abolitionist efforts during the Civil War, and of course Mrs. O’Leary’s famous cow-created fire. While Mrs. O’Leary likely didn’t start the fire (anti-Irish sentiment at the time most likely fanned that particular flame), she has become a famous piece of history. Anyone who has taken the Architecture Tour downtown knows the rest of that story, we rebuilt even stronger. Happy birthday to the home state! Fewer and fewer people in Chicago are taking trains and buses, according to a recent memo from the Regional Transportation Authority. The RTA, which oversees the CTA, Metra and Pace, reported this week that ridership for 2018 is expected to finish 2.6 percent lower than 2017, to 578 million rides from 593.5 million rides according to the Tribune. Low gas prices and ride share programs like Uber and Lyft have undoubtedly affected the number of rides, which fell from 590 million rides to 570 million, give or take a few. Despite the reduction the CTA is finding some positives to focus on moving forward. 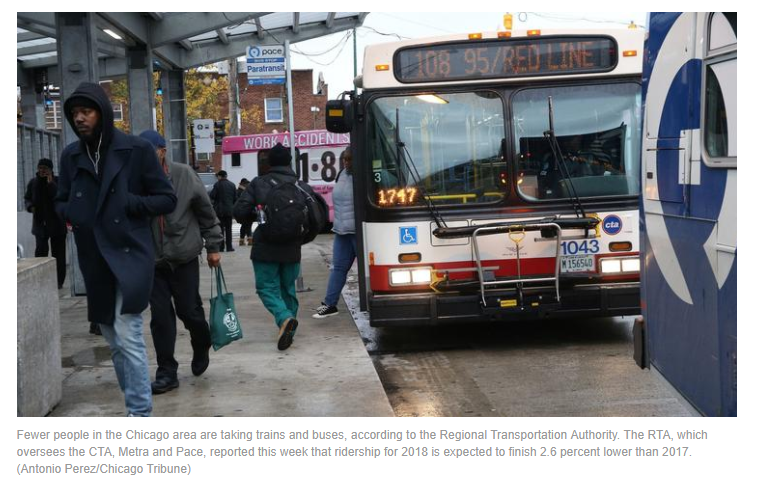 Jeremy Fine, chief financial officer for the CTA, told the RTA board during its monthly meeting on Thursday that gas prices have risen and Loop employment is strong, both of which are increasing ridership. The CTA has seen commuters buying more monthly passes, rather than paying by the ride, which indicates more frequent use. The primary focus now for Chicago becomes to avoid the problems that have plagued New York City and Washington, D.C. who have recently experienced dramatic problems with their public transit. “The CTA and its partners Metra and Pace are in big, big trouble if we do not get an infrastructure bill and improved operating reimbursement from Springfield over the next several months,” said RTA chair Kirk Dillard.